Today's post is neither on economics nor on politics. However, it is in many ways a malaise that is symptomatic of the society's and government's rotten attitude toward a disease called HIV. Ever since its discovery, HIV has been described as a 'modern day scourge'. While it is only a disease, its occurrence, unfortunately, often brings ostracism and social stigma. While no single effective cure is available, anti-retroviral drugs often slow down its spread and are effective in prolonging life. However, such drugs are very expensive and are beyond the reach of most HIV patients, especially in Sub-Saharan nations, where the incidence of the disease is widespread. HIV can devastate not just a country's social fabric but also its economy. The African nation of Botswana is a case in point. For nearly two decades (1980-90s), it experienced one of the fastest economic growth rates in the African continent. In its wake, it generated employment, brought higher incomes, helped gain access to education, sanitation, and healthcare; all these brought about a general improvement in the overall quality of life for lakhs of people in Botswana. However, all these benefits of economic growth are threatening to unravel because of the widespread prevalence of HIV in Botswana. The current national prevalence rate, i.e. rate of incidence, among 15-49 years old is 24.8%! As an entire generation falls victim to HIV, families have to spend more money on buying medical care for the afflicted, thus reducing the family's access to a better quality of life (including reduced expenditure on food). Also, as productive people contract HIV, they can no longer work (because of health conditions and social stigma), thus robbing the economy of its productive workforce and the family of its breadwinner. In fact, to put the matter in perspective, by 2020 Botswana would lose 20% of its farm labour to HIV. To this, add another fact: between 1999-2005, the country had lost 17% of its healthcare staff to HIV. A few years ago, the UNDP had estimated that by 2010, nearly 20 per cent of all children in Botswana will be orphaned. The situation for the children is likely to get worse as the primary care-givers (in the absence of dead parents) - the current generation of grandparents - begin to die. To compound the misery of these children, they will have to drop out of school to work and earn to contribute to family income. If you believe that faced with a tragedy of such gigantic proportions, people in Botswana would be sympathetic to people living with HIV, then you are mistaken. Social stigma and boycott continue to dog the victims of HIV. Most people are socially boycotted; they suffer economically too as they are denied jobs. 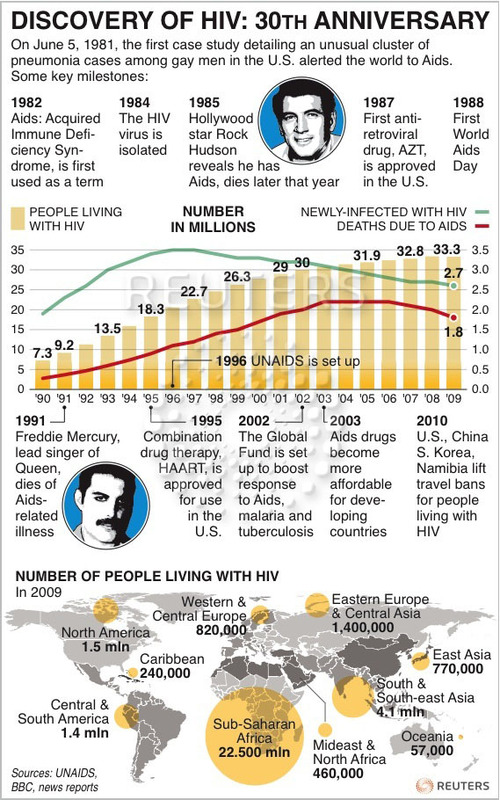 Here is a graphic that captures the history of the HIV. As the graphic shows, I sourced it from Reuters.